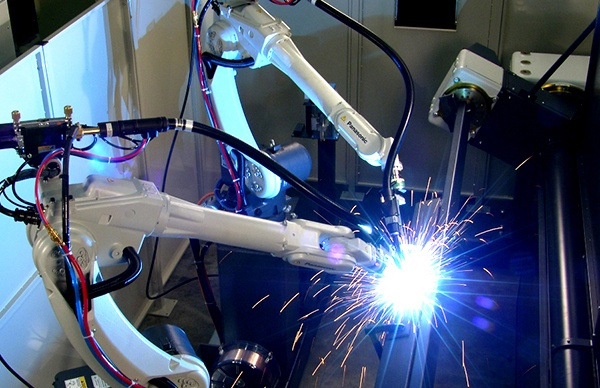 Welding automation can be categorized as 1) hard automation or 2) robotic (sometimes called “flexible”) automation. Hard automation is the simpler and least expensive of the two to implement. 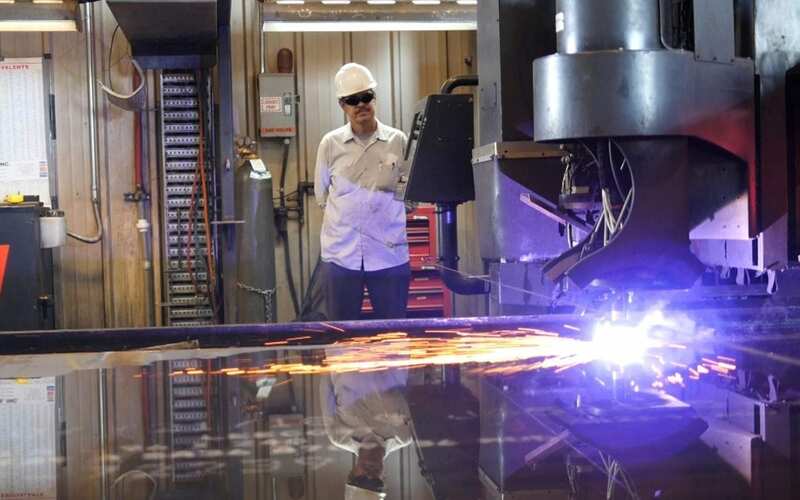 It lends itself to gantry, track and turntable applications where the weld joint can be easily tracked such as in the fabrication of I-beams, pipe, and tanks. Robotic automation is more complex. It relies most often on a robotic “arm” that has six axes of movement to weld more complex parts. Regardless of which form of automation you consider, the biggest advantage is the potentially enormous reduction in labor costs. Usually, but not always, OPERATING FACTOR (or arc-on-time) has the most profound impact on said reduction. For example, a tractor can weld continuously for as long as the welding and control cables will allow it to go. A human welder would have to stop regularly. In contrast, a robot is usually not going anywhere (unless it’s mounted on a rail or beam, a 7th axis) but has incredibly fast air movement speed between welds. Whether hard or robotic automation, it is not unusual for operating factor to increase from 15-30% to in excess of 80% if parts can be continuously fed into the welding zone(s). Another factor potentially driving automation labor costs down is significant increases in weld deposition rate and travel speed. A human may be able to weld with metal-cored wire and lay down 17 lbs/hr. However, he/she will not be able to handle arc heat and, most importantly, move fast enough to deposit the correct size weld. 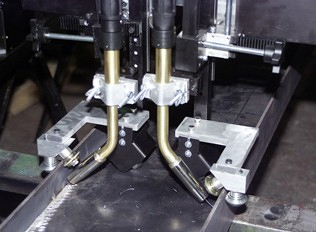 Moving as fast as possible from point A to B is optimal and over-welding wastes time. A reduction in weld re-work is another major labor reducer. If, and this is a big if, parts repeatability is achievable and precise, then tight fixturing is employed. Looking at this from another angle, if a robot is producing high-quality welds every time, the orders will keep coming in. When order keep coming in, your reputation and sales will grow. Re-work saps productivity and poor quality ensures your eventual demise. Automation is clearly for high output fabrication applications, and General Air can help you determine an accurate ROI.